بسیاری از شرایط هیدرولوژیک در دریاها به تغییر دما بستگی داشته و میزان این پارامتر عامل تعیین کننده مهمی در شرایط محیطی هر منطقه می‌باشد. تغییرات دما و باد سطحی سبب تغییر چگالی آب دریا شده و تغییر چگالی در میزان پایداری و اختلاط ستون آب دریا مؤثر است .دراین تحقیق اثر متقابل دمای سطح آب دریا (SST) بر سرعت باد سطحی درمنطقه خزر جنوبی (استان مازندران) بررسی شده است. ابتدا داده‌های دمای سطح آب دریا،توسط سنجنده AVHRR ماهواره NOAA وداده‌های سرعت بادسطحی،توسط ماهوارهQuikSCAT برای منطقه‌ای به ابعاد 220 ×340 کیلومتر مربع در خزر جنوبی گردآوری شد. پس از تجزیه وتحلیل داده‌های ماهواره‌ای دمای سطح دریا ، تغییرات ماهانه و فصلی آن توسط نرم افزار Tecplot برای این منطقه رسم گردید.مشخص شد که میانگین دمای فصلی(بهار و تابستان) سواحل شرقی خزرجنوبی c ْ87/0 ازنواحی غربی آن بیشتراست. برای بررسی اثر متقابل دمای سطح دریا برسرعت باد سطحی، چهار ایستگاه A وD (درناحیه غربی)،B وC (درناحیه شرقی)درخزرجنوبی انتخاب گردید.سپس نمودار سری زمانی دما، اختلاف دمابین چهار ایستگاه، سری زمانی سرعت بادو سری زمانی اختلاف سرعت باد بین چهار ایستگاه ازسال 2000تا2005 برای فصل‌های بهار و تابستان رسم و مقایسه شد. نتایج نشان می‌دهد که برای فصل تابستان،در80% و برای فصل بهار، در 66% مواردبا افزایش اختلاف دما بین چهار ایستگاه، اختلاف سرعت نیزافزایش می‌یابد.در این دو فصل بدلیل کاهش فعالیت سیستم‌های جوّی، اختلاف دمای دو ایستگاه تأثیر قابل توجهی درتقویت اختلاف سرعت باد دارد. میانگین اندازه اختلاف سرعت باد در دوره آماری2005-2000 در ایستگاه‌ها برای فصل بهار ، m/s 7/.و برای فصل تابستان ،m/s 37/1 می‌باشد. Many hydrological conditions in the seas depend on temperature variation, and the rate of this parameter is an important determinant in the environmental conditions of each area. The variations in temperature and surface wind causes changes in the density of the sea water, and the change in density affects the stability rate and mixing of the sea water column. In this research, the mutual effect of sea surface temperature (SST) on surface wind speed in the southern Caspian region (Mazandaran province) has been investigated. First, the sea surface temperature data was collected by the AVHRR sensor of NOAA satellite and surface wind speed data was collected by QuikSCAT satellite for an area of 340 × 220 square kilometers in the southern Caspian Sea. After analyzing the satellite data for sea surface temperaturel, its monthly and seasonal variations were drawn by Tecplot software for this area. It was found that the average seasonal temperature (spring and summer) of the eastern coast of southern Caspian Sea is 0.87 degrees centigrade more than that of the eastern coast. In order to investigate the mutual effect of the sea surface temperature on surface wind speed, four stations, A and D (in the western region), B and C (in the eastern region) were selected on the southern Caspian Sea. Then, the graph of temperature time series, temperature difference between the four stations, time series of wind speed and time series of wind speed difference between the four stations from 2000 to 2005 were plotted and compared for the spring and summer seasons. The results indicate that, with increasing temperature difference between the four stations, the difference in speed also increases in 80% of the cases for the summer and in 66% of the cases in the spring season.In these two seasons, because of the decrease in the activity of atmospheric systems, the temperature difference between the two stations has a significant effect on improving the wind speed difference.Average wind speed difference in the statistical period of 2000-2005 at the stations is 0.7 m/s for the spring and 1.37 m/s for the summer season. 1- جلال زاده.ز، ترابی آزاد.م ،دالکی.الف ،(1387 )مقایسه دمای سطحی حاصل از داده‌های میدانی و ماهواره‌ای در خزر جنوبی، پژوهش‌های جغرافیایی طبیعی،65، 121-109. 2- حسن زاده .الف، علی دوستی. م، 1384، تغییرات فصلی و درون سالی پارامترهای جوّی و اقیانوسی در دریا و سواحل خلیج فارس، ششمین همایش علوم و فنون دریایی ایران، تهران. 3- حسن‌زاده .الف، بیدختی ع. ع، ملا اسماعیل پور. س، 1384، بررسی تغییرات دمای سطح (SST) آبهای خلیج فارس و تأثیر آن بر آب و هوای مناطق ساحلی در سال‌های 1996-2000، ششمین همایش علوم و فنون دریایی ایران، تهران. 4- حسن‌زاده .الف، خدابخش .ح، حسینی بالام. ف، ناهید .ش، 1380، اثرات ال‌نینو روی پارامترهای فیزیکی و جوّی در دریای عمان، کنفرانس فیزیک ایران، سبزوار. 5- حسن‌زاده .الف، خدابخش. ح‏، رئیس‌السادات. ح، 1382، دمای سطح آب و تأثیر آن بر آب و هوای ساحلی در ناحیه شمال اقیانوس هند، سومین کنفرانس منطقه‌ای و اولین کنفرانس ملی تغییر اقلیم‏، اصفهان. 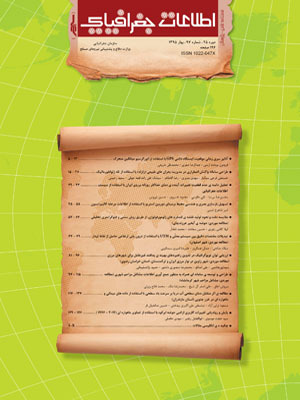 6- غلامی،م، (1388) اثر دمای سطح دریا (SST) بر آب و هوای مناطق جنوبی دریای خزر، پایان‌نامه کارشناسی ارشد فیزیک دریا، دانشگاه آزاد اسلامی واحد علوم وتحقیقات،3-35. 7- نوری. ل، (1388) مطالعه برهم کنش هوا-دریا ومحاسبه شارهای سطحی وامواج ناشی ازباد، پایان نامه کارشناسی ارشد فیزیک دریا، دانشگاه آزاد اسلامی واحد علوم وتحقیقات،64 . 8- Ahmadabadi A., Fathnia A., Karimi Ahmadabad M., Farajzadeh M, 2008, ‘The Accuracy of SST Retrievals from NOAA-AVHRR in the Persian Gulf’, Journal of Applied Sciences, Vol. 9, No. 7, pp. 1378-1382. 9- Battisti,D. S.,and A. C. Hirst, 1989,Interannual variability in the tropical atmosphere-ocean model: Influence of the basic state, ocean geometry and nonlineary.j.Atmos.Sci.,46. 10- Chelton,D.B.,S .P.Xie , 2010,Coupled ocean-atmosphere interaction at oceanic mesoscales,Oceanography,52-60. 11- Chunzai,W., R. H. Weisberg ,and H. Yang,1998, Effects of the Wind Speed- Evaporation-SST Feedback on the EL Nino-Southern Oscillation J. of AtmoS. Sci., 56,1391-1402. 12- Csanady,G.T., 2004,Air-Sea Interaction Laws and Mechanisms, Cambridge University Press 28-32. 13- Hayes, s. p., p. Chang, and M. McPhaden, 1991, Variability of the sea surface temperature in the eastern equatorial Pacific during 1986-1988. J. Geophysics. Res., 96, 10553-10566. 14- Ibrayev,R.A.,E. Özsoy ,C. Schrum and H. i.Sur, 2009,Seasonal variability of the Caspian Sea three-dimensional circulation, sea level and air-sea interaction, Ocean Science,1926-1928-1936-1948 . 15- Kostianoy.A.G , Aleksey N. Kosarev, 2005, The Caspian Sea Environment, Springer-Verlag Berlin Heidelberg, Germany. 16- Lebedev.S.A. and Andrey G. Kostianoy, 2008, Integrated Use of Satellite Altimetry in the Investigation of the Meteorological, Hydrological, and Hydrodynamic Regime of the Caspian Sea, Terr. Atmos. Ocean. Sci., Vol. 19, No. 1-2, 71-82. 17- Li, X., Krasnopolsky, V. and Sapper. J.,2001, Validation of coastal Sea and lake Surface temperature measurements derived from NOAA/AVHRR, International Journal of Remote Sensing. 22(7). Pp 1285-1303. 18- Narvekar J., Kumar P., 2006, Seasonal variability of the mixed layer in the central Bay of Bengal and associated changes in nutrients and chlorophyll, Deep-Sea Research. I., 53. 820-835. 20- Oesch, D, Hauser, A. and Wunderle, S, 2002, Deriving Lake Surface temperature Variations of an alpine Lake using NOAA-AVHRR date, Remote Sensing research group, Department of Geography, University of Bern Switzerland. 21- Oesch, D., Hauser, A. and Wunderle, S. ,2003, Operational mapping of lake surface temperature in the Alps using NOAA-AVHRR data: Intercomparison of different lakes. Remote sensing research group, Department of Geography. University of Bern, Switzerland. 22- Rasmussen, E. M.,and T. H. Carpenter, 1982, Variations in tropical sea surface temperature and surface wind fields associated with the Southern Oscillation/El Nino. Mon. Wea. Rev., 110,354-384. 24- Thiemann. S. and Schiller. H., 2003, Determination of the bulk temperature from NOAA/AVHRR Satellite data in mid latitude lake, International Journal of Applied Earth Observation and Geoinformation, 4:339-349. 25- Tokinaga,h. ,Y. Tanimoto,and s. p. Xie ,2005,SST-induced surface wind variations over the Brazil/Malvinas Confluence:Satellite and in-situ observations ,J. Climate , 2-5. 26- Weisberg, R. H., and C. Wang, 1997, Slow variability in the equatorial west-central Pacific in relation to ENSO. J.Climate, 10,1998-2017 .